Get excited! Camp is right around the corner and Everything Summer Camp recently added our newest camping lantern to our product lineup. Boy does this little light shine! Collapsible, the Passenger 1 Watt Dynamo Powered LED Lantern from First Gear won’t take up too much space to pack up but it will certainly light up the night! The Passenger Lantern is the top choice since it can be powered by four different sources: its own built-in, rechargeable battery, a Dynamo-crank, a USB cable (which comes included), or DC cable (also included). 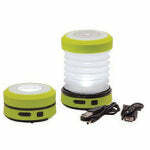 It can throw light over 65 feet and it charges in only four hours by the USB and DC cables. But, if you don’t have access to any electricity, you can use the Dynamo Crank to power the lantern. If you crank for just one minute, this lantern will burn for eight minutes on its high level—and nearly 20 minutes on low. This way, no matter where you are or how unprepared you may be, as long as you bring your Passenger lantern along with you, you have light. And with an LED bulb lifespan of 6,000 hours, you can rest assured that you’ll get lots of use out of this lantern! Made of durable ABS material, the Passenger Lantern is waterproof so a little rain won’t do it any harm! More than prepared for the hard-wearing, testing lifestyle of most campers, the Passenger 1 Watt Dynamo Powered LED Lantern was made to see you through not just this season of summer camp, but many, many seasons. Our hat’s off to the fine people at First Gear, the manufacturers of the Passenger Lantern, for making such a reliable, durable, and affordable product. It’s great to offer a product with such usefulness and practicality.